Get in touch with nature at Doi Inthanon and Maesa Elephant Camp. Family-friendly places like Tiger Kingdom and Thai Elephant Home will thrill your kids. 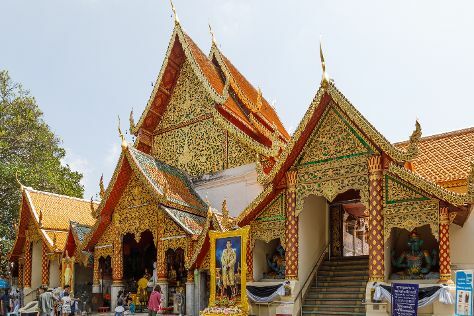 Explore the numerous day-trip ideas around Chiang Mai: Thai Elephant Conservation Center (in Lampang), Wat Phra That Doi Suthep (in Doi Suthep), Woody Elephant Training (in Mae Taeng) and Mae Rim (Elephant PooPooPaper Park & Grandma's Thai Recipes). Spend the 10th (Fri) wandering through the wild on a nature and wildlife tour. On the 11th (Sat), enjoy an adventurous day among the treetops at some of the top local zipline courses and adventure parks. There's much more to do: explore the ancient world of Wat Chedi Luang Worawihan, admire the striking features of Wat Chet Yot (Wat Maha Photharam), soothe aching muscles at some of the top local wellness centers, and contemplate in the serene atmosphere at Wat Phra Singh. To see photos, where to stay, traveler tips, and tourist information, read our Chiang Mai travel itinerary creator. If you are flying in from United Kingdom, the closest major airport is Chiang Mai International Airport. In November in Chiang Mai, expect temperatures between 37°C during the day and 24°C at night. Wrap up your sightseeing on the 12th (Sun) early enough to travel back home.